Once upon a time in a misty, enchanted forest, there lived a colony of good elves. These elves had a major problem, though. Their prized mushroom garden was infested with pests--a giant Centipede, a poison-spreading scorpion, a mischief-making spider, and a pesky flea. The good elves tried everything they could to rid their garden of these bugs. But nothing worked. One day, an elf named Oliver was hacking away at a poisoned mushroom in the garden. Suddenly, he saw an unusual stick gleaming in the dirt. Just as Oliver picked up the stick, a spider jumped out from behind a mushroom and rushed at him. When Oliver waved his hands wildly to try to scare the spider away, sparks flew from his stick and the spider disappeared! "How did that happen?" Oliver wondered out loud. "Could this be a magic wand?" Soon Oliver had another chance to try the wand. When the scorpion scurried across a row of mushroom, poisoning every mushroom it touched, Oliver pointed the wand at the scorpion and shouted, "Be gone!" Instantly, the scorpion disappeared and the poisoned mushrooms were transformed back into normal mushrooms. "This is great! This is the tool we need to clean up our mushroom garden!" Oliver shouted ecstatically. With his new found magic wand, Oliver hid behind a mushroom. "OK, you great big Centipede," he said. "Come out wherever you are. I'm ready for you now!" --From the Atari 2600 Centipede instruction manual. Centipede is credited as the first game to be developed by a woman. It was also one of the first arcade games to have a rather large female fan base. This port to the 2600 is good. 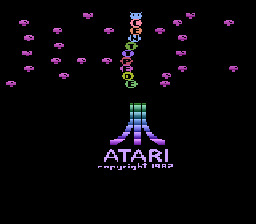 The graphics don't look that close to the original, but that's typical for the Atari. The sounds were good considering the lack of hardware power of the 2600. The important thing was the gameplay which stayed pretty true to form. It was still a lot of fun to play. The controls were decent but they were nothing compared to the ball controller on the arcade machine. Although, while playing on CC you can use your mouse for the controller which is a lot closer to the original ball controller. destroy. If the Centipede reaches the bottom of the screen, it moves back and forth within the player area and one-segment "head" Centipedes are periodically added. This continues until the player has eliminated both the original Centipede and all heads. When all the Centipede's segments are destroyed, a new Centipede forms at the top of the screen. Every time a Centipede is eliminated, however, the next one is one segment shorter and is accompanied by one additional, fast-moving "head" Centipede. A player loses a life when hit by a Centipede or another enemy, such as a spider or a flea. The flea leaves mushrooms behind when fewer than five are in the player area, though the number required increases with level of difficulty. There are also scorpions, which poison every mushroom they touch, but these never appear in the player's movement region. A Centipede touching a poisoned mushroom hurtles straight toward the player's area. Upon reaching it, it returns to normal behavior. Don't let the centipede, whether whole, partial, or just a head segment, reach the bottom of the screen. If it does, another head segment will appear onscreen.